The aim of the game is to make a number as close to half a million as possible. Which of the numbers in the table is closest to half a million? This game uses ten cards numbered 0, 1, … 9. The cards are put face down and mixed up. Each player has six boxes in which to write the digits as they are called out and can’t change their positions once they have been written down. The teacher or group leader picks cards one at a time and calls out the number then puts that card aside. Altogether six different digits are drawn in random order. The players write the numbers in the boxes as they are read out trying to finish with a number as close to half a million as possible. Asha wrote 478 362 and Tau wrote 732 468. Which of them was closest to half a million? Bill wrote 476 328 and Lulu wrote 684 327. Which of them was closest? Ben wrote 678 432 and Ada wrote 724 638. Which of them was closest? Which of the six learners won that round? Which pair of learners got a combined total closest to one million? Play this game with your whole class or with a group of learners. 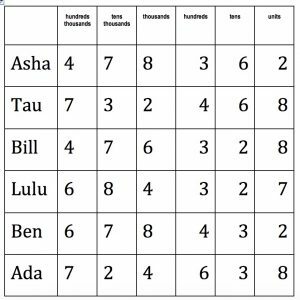 In each round a player scores a point of they get the total closest to half a million or if their combined total with their partner is closest to one million.